Outside of the physical signs, the dancing sun, the supernatural occurrences with the Cross on Mt. 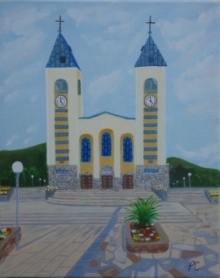 Krizevac, the word “Mir” written in red across the sky, the miraculous healings, etc., the visionaries themselves are a sign, the most studied sign of the entire Medjugorje phenomenon. It is their testimony that they see the Virgin Mary, Mother of Jesus Christ. This testimony has been challenged by countless individuals over the years, from the Bishop of Mostar, to Catholic theologians, to medical and scientific doctors of every specialty. A very intriguing apparition sets the back drop to what will follow in the testing of the visionaries through the coming years—when science takes a close look at these six individuals to examine their experience. Many come with the expectation that their tests will disprove the testimony of the visionaries. Most interesting is how Our Lady, Herself, responds to the testing of Her chosen visionaries. And from Her response, we are given greater insight into God’s thoughts concerning the “debate” between science and faith. The feast of the Immaculate Conception of the Blessed Virgin Mary in the parish of Medjugorje was permeated with a unique and exceptional spiritual atmosphere. The multitude of faithful prepared itself for that feast day with a strict nine-day fast and long recollected prayer. The main idea of the highly attended devotional novena was to draw closer to the Immaculate Virgin with a heart as pure as possible. In the first days of the apparitions, we really competed with each other, seeing who could pray more rosaries each day. That was unhealthy competition. Although Our Lady was exhorting us to pray not that way, but with our hearts, we did not understand what it meant to pray with the heart. That night she said to us, "This evening, before you start praying, you should all forgive one another." We thought, "That's something simple, we do that in every Holy Mass!" But by no means was it easy; it was quite an effort. It meant that everyone who had built up hostilities within his heart had to give them to God immediately with love and joy. I explained what Our Lady's request meant and asked all the faithful if they understood. Everyone said yes, but no one did anything. We felt as if we were in a desert, and we were even a little afraid. Moreover, Our Lady would not allow us to pray until we had personally reconciled with each other - until we had forgiven each other from our hearts. A silence came over us; it seemed to last forever. We suffered a desert-like anguish, and it grew later and later. An Interview With Fr. Tomislav Pervan "Medjugorje, The New Emmaus"
PRAYING WITH THE HEART By: Fr. Jozo Zovko, O.F.M.